President Mnangagwa resumes his 2019 ‘Thank You’ rallies at Murewa Centre on Saturday 2 February 2019. Mashonaland East Zanu PF provincial chairman Cde Joel Biggie Matiza said the rally gives the province an opportunity to prove to detractors that the President has the support of the people of Zimbabwe despite protests led by unruly opposition MDC Alliance elements recently. “We have been given an opportunity to show the world that we are all behind our President,” he said. 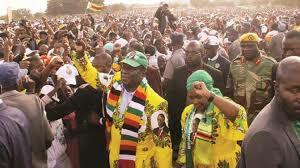 Zanu PF Politburo member Dr Sydney Sekeramayi and Mashonaland East Minister of State for Provincial Affairs Cde Apolonia Munzverengwi appealed to the people of the province to come to the rally in their thousands.